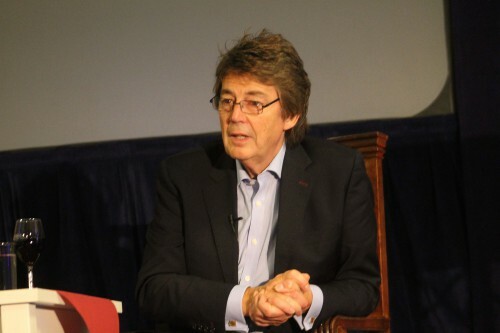 Mike Read seemed so at home on Saturday evening talking in his home town at the Literary Festival with Sue Cook. Mike who moved to Henley just two years ago was talking about his newly published autobiography, Seize the Day. His natural ease with the audience was shown at the start when his phone rang and he told the caller he was just doing his Henley Literary Festival talk! Mike said he used his work diaries to trigger the memories to help him write his book. The writing came to a sudden halt though, after completing over 100,000 words, when his laptop was stolen and he to start all over again. Sue then asked Mike about his love of poetry and how he first got interested in it. He started off being fascinated by Rupert Brook and his modern ‘haircut’. Mike said, “I was intrigued by this man who was out of his time.” Mike founded the Rupert Brook Society in 1999. Mike went on to write music around poems and poets including the musical Oscar about Oscar Wilde. The Oscar musical however caused Mike’s ‘black hole’ in his life as he had invested his own money in it and the show closed after only 8 days. He was declared bankrupt and had to sell his precious record collection to pay everyone off. Mike told the audience though “I digitalized it before I sold it! Having fun and seizing the day was definitely the message the audience left with.